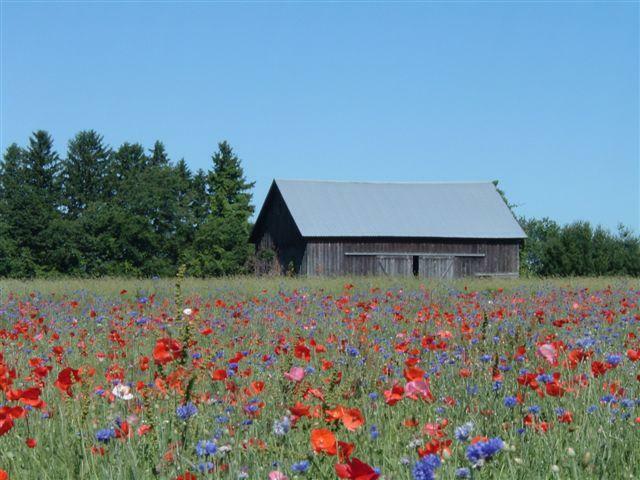 Wild flowers on the farm. My friend Stacy was amazed at how many of the students never held a summer job. They asked if they would be stiff and sore every morning. My husband John and I joked about how we still felt every muscle after a day of grading and packing several tons of blueberries, but the four of us also ruminated on how interns can restore our wonder and dedication to organic methods as we watch them experience farm life. A couple of years ago, the small farmer guru Joel Salatin wrote an article about how farms thrive when multiple generations work the land. Because less than one percent of the American population was employed in agrarian pursuits, he urged farmers to welcome interns so that young people would embrace agriculture. For many years, John and I had nurtured numerous apprentices from as far away as Japan and the Netherlands, until we adopted our sons and concentrated on raising them. While pondering Salatin’s thoughts, a friend from Ann Arbor called and asked if we would hire her daughter, Lisa, and her best friend, Rebecca, who were finishing their freshman years in college. I looked at John, and he nodded his head. “Yes, when will they arrive?” I answered. On a June day, the duo rolled up in a white Subaru Outback stuffed with sleeping bags, a box of books, a guitar case, and a jumble of clothes. Dreadlocks dangled around Rebecca’s shoulders, as she stretched out her hand and introduced herself; I hugged blond-haired, diminutive Lisa whom I had known since she was ten. After showing the young women the old white farmhouse where they would live, and talking a bit about our farm’s routine, we left them to settle in. The next day heat waves shimmered off the hay field as John drove the baler while Lisa and Rebecca stacked hay bales onto the low wagon with a high rack rising from the far end. Hay chaff coated their arms, clogged their throats and sifted into their boots. Wide sombreros shaded their faces from the ninety degree sun. “Like your hats,” I said, and then poured everyone a round of lemonade as we paused in the shade of the hay barn. “Oh, thanks, but we’ll cook something,” Lisa said. Sweat plastered her red t-shirt and jeans to her slim body. Organic blueberry farm near Lake Michigan. A few weeks later, the girls would reveal that they had been so exhausted that they had collapsed and slept for a couple of hours before hitting Lake Michigan’s beach. Over the next two months their hands developed calluses as they weeded young blueberry bushes, thinned peaches, and hoed the garden. But we also found them perched in sweet cherry trees, red juice dribbling from the corners of their mouths or wandering along a farm lane, plucking blackberries. Meanwhile, a pyramid of empty, vegetarian refried bean cans grew on their kitchen counter. “What are you two giggling about?” I asked one morning as we taped together boxes to hold blueberries. “How many tacos we plan to eat for lunch,” Rebecca said. “And for dinner, she ate nine yesterday,” Lisa said, and we all laughed. By the end of what John and I dubbed Pleasant Hill Summer Boot Camp, Lisa and Rebecca not only had stronger muscles, but they had developed an inner strength that helped them tackle arduous jobs. They understood that when a crop needed to be harvested, the farmer had to ignore the heat and humidity and focus on the satisfaction of a barn stuffed with hay bales or boxes of frozen blueberries waiting to be purchased. After the girls departed, John and I moped around, grieving our taco-eating duo that had added a certain spice to our summer and rejuvenated our passion for farming. A couple of weeks later, Lisa sent me an email. “Miss you too,” I wrote, and then returned to posting an advertisement for next summer’s interns on an organic farming webpage. “The great thing about blueberries is you can pick them, you can freeze them, you know, without a whole lot of preparation, and just pour them on stuff,” says James Hancock, professor of Horticulture at Michigan State University. If you haven’t guessed, Hancock has a passion for blueberries. In fact, he has spent the last 30 years cultivating the berry. 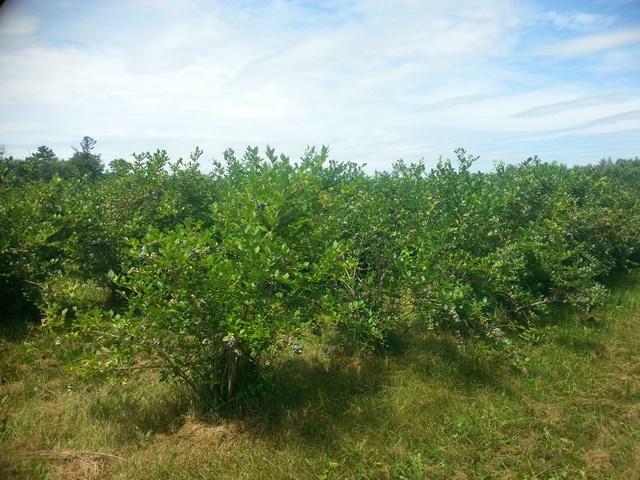 The blueberry industry in Michigan has been commercially growing berries since the 1900s. In 2011, the Michigan blueberry industry spanned 18,000 acres and yielded 72 million pounds of fruit valued at more than $118 million. Hancock has developed three of the most widely planted blueberry varieties throughout his three decades at MSU. He breeds high bush blueberries: the Aurora, the Draper, and the Liberty blueberry. Hancock said his blueberries are not genetically modified. Some are grown as far away as Chile and South Korea. China is already playing a role in Michigan’s effort to diversify its economy. The country’s 1.3 billion people don’t want just cars from Michigan companies, they also want Michigan foods. 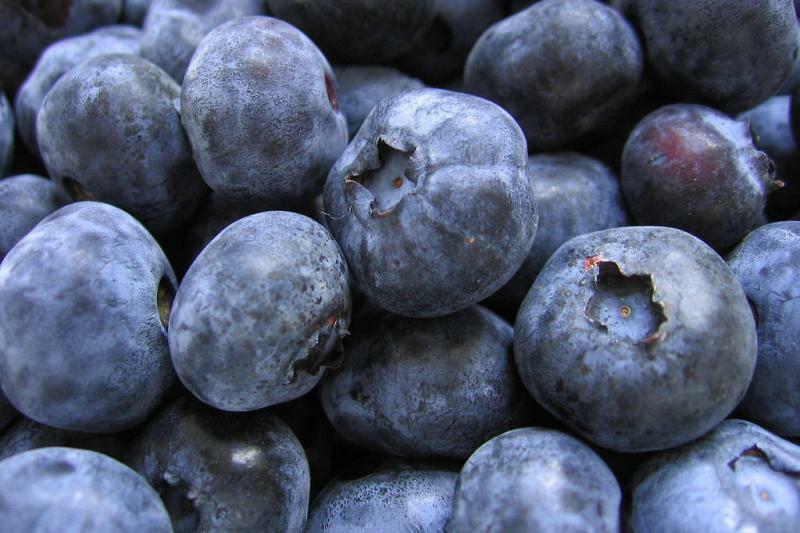 From baby food to blueberries, Michigan is tapping into a new and profitable market in China. Michigan is the largest blueberry producing state in the country, and Van Buren County produces the most blueberries in Michigan. “It’s natures perfect fruit, if you stop and think about it. There’s not any seeds that you have to deal with. You don’t have to peel it. You rinse it. You eat it. And not only do they taste good, they’re good for you,” Shelly Hartmann said. Hartmann owns The Blueberry Store in downtown South Haven and a huge blueberry farm, True Blue Farms, in Grand Junction. At The Blueberry Store you can get just about anything with blueberries in it. “Blueberries aren’t just for pancakes and muffins anymore,” Hartmann said. I spot blueberry bath soaps, blueberry coffee, frozen and fresh blueberries, blueberries in brats and sausages, chocolate covered blueberries, blueberry candles, dog treats, mustard, popcorn, soda pop, butter, cookies, pancake mix, pie filling, jam, jelly and blueberry whoopee pies. Plus there’s dried blueberries, and even blueberry flavored beef jerky. The list goes on and on. Hartman says this year’s crop has been affected by the dry conditions, but fared much better than other fruits grown in the region. The National Blueberry Festival celebrating the region’s top fruit crop in South Haven is nearly 50 years old. Organizers typically expect around 40,000 people to come for the blueberry pancake breakfast, the live music, a blueberry parade and the very messy but very entertaining blueberry pie eating contest. 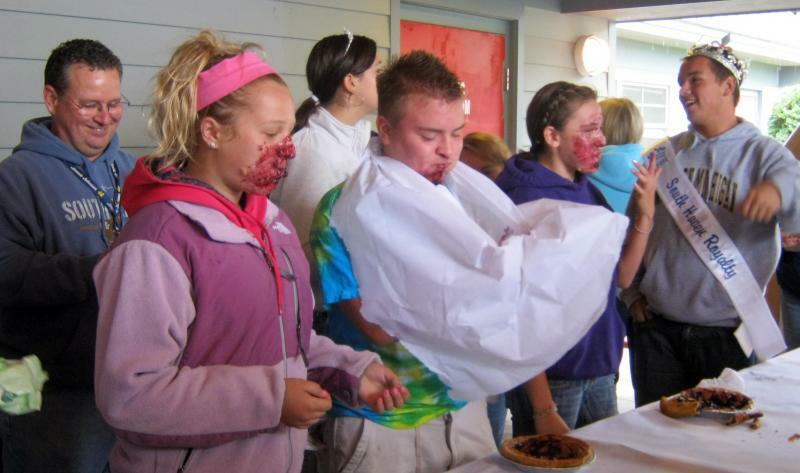 Here's a video the festival posted on youtube of one of the blueberry pie eating contests Friday afternoon. It’s been a couple of roller coaster years for the state’s fruit growers. 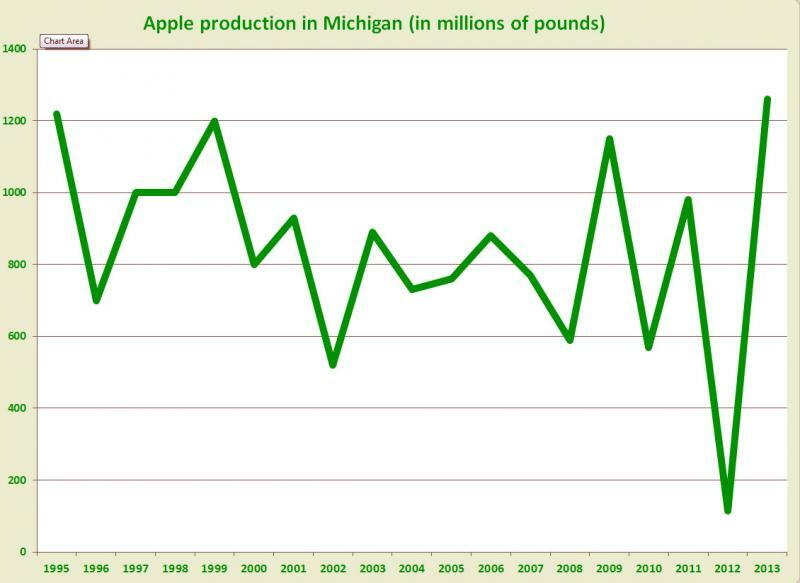 Michigan apple growers had the most dramatic ride. 80-degree weather in March 2012, followed by multiple freezes caused total crop failure that fall, the worst since 1945.